Mark Still, Master Electronics Designer, Recording Engineer and Musician has been in the industry for many years. When Mark was six years old, his Grandmother would take him to thrift stores to buy record players by the dozen. He would take them home and begin assessing what needed to be fixed or how to take parts from one and make them work on another. He then sold them to friends and family. Mark has always loved music and as a young child liked to watch how things work like turntables go around and tubes glow. Mark always had the best (and most complex) audio systems on the block. His friends would always ask, what does that component do or how do you know how to hook all this stuff up? He also converted a lot of records to cassette for people using his equipment. He played baritone in a brass marching band with his brother, then moved to the bass guitar playing in various bands around town. He eventually started playing rhythm and then lead guitar. He maintained all his amplifiers and equipment himself, sometimes modifying them to create his own unique sound. In high school, he had a recording studio and a 4-track tape machine where he recorded all the local bands and events, mastering them down to 2-track. Mark was in a band and eventually recorded an album that was cut to vinyl. At the same time, he was asked by one of the guitar teachers if he would tour with them as their sound and recording engineer. He spent that last summer in high school touring with that band. The guitarist was from the band Stephen Wolf. Mark's family owned a machine shop, so engineering came natural to him and he has a passion for mechanical design and engineering. At that point, Mark transitioned to test, fix and repair computer boards from IBM and DELL at the dawn of the computer age. The money in computers was great but looking back he says he should have stayed with audio based electronics. Mark moved from the electronics side of computers to designing and writing software where he could release his creative side of design and engineering. Feeling the passion Mark got his recording certification from Oak Grove Recording with the renowned Joe Laquidara , who wrote and produced hit songs for the band Boston. Mark is now a certified recording engineer. In 2010, Mark took a year off to rediscover his passion for audio and music. 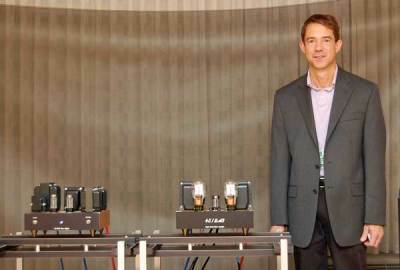 That year, he designed a single-ended amplifier that he took to Rocky Mountain Audio Fest, where it was received positively driving a pair of Rethm loudspeakers. Once Mark did this, it unleashed his passion and desire to design, create, and build audio equipment that competes with the best equipment available today. His passion for quality and design work are unmatched. He says he is not done with a design until he has exhausted all other possibilities. Only then does he know he has the best design possible. Mark is building and selling his equipment in very limited quantities out of his home electronics laboratory. It is exciting to see what Mark is creating today and in the future. Each and every one of Mark's products are hand made one at a time using the best parts available today. Mark designs his products to last forever considering every last detail before the final prototype is put into production.